Scan of original letter from "The Engines of Our Ingenuity". See link for full story. The first commercial radiotelegraph message (Marconigram), was sent by Lord Kelvin, June 3, 1889 from the Needles Wireless Telegraph station (on the grounds of the Royal Needles Hotel) at Alum Bay on the Isle of Wight. 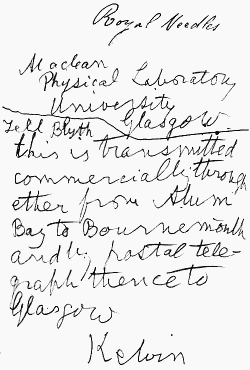 Scan of original plain paper manuscript from Marconi Calling, see link for more information. Also see a copy of the telegraph instructions. Copies of the message were sent to Sir George Stokes and Sir William Preece. Lord Kelvin insisted on paying a token shilling royalty on both, thereby setting precedent for commercial wireless telegrams and challenging the Post Office’s strictly controled monopoly on telegraph service (it was illegal for anyone to send a commercial telegraph). I do not know how I can ever thank you enough for the most kind letter of May, 10, which I found in my cabin in the Lucania, with the beautiful books which you most kindly sent me along with it:—“The Buried Temple”, “The Gospel of Bhudda”, “Les Grands Inities”, the exquisite edition of Rossetti’s “House of Life”, and last but not least the Century Magazine for June, 1900 with the splendid and marvelous photographs on pp. 176, 187, 190, 191, 192, full of electrical lessons. Thank you also warmly for the beautiful flowers. DEAR PROF. PEIRCE—I send you by book packet along with this two articles on deep-sea sounding by pianoforte wires. You will see that I have been obliged to contrast our own Admiralty not very favourably with yours in respect to liberality towards suggestions for improvement. Our authorities are indeed exceedingly heavy to move in any way which involves the introduction of new ideas. I am not allowing suggestions for distinction of lighthouses by groups of eclipses of short and long, according to the Morse system, to fall asleep. A lighthouse on this plan has been in action on Holywood Bank, Belfast Lough, since the first of November, and I am told by the harbour authorities that captains, pilots, and sailors are all much pleased with it. They know it with perfect confidence from any other light afloat or ashore. It was till last November a red fixed light which could only be seen about two miles off, and was constantly liable to be mistaken for a ship's port-side light. When my eclipsing machine was applied to it the red shade was removed, and in all respects the light was left unchanged. Besides having the advantage of being unmistakable for anything else, it is now visible for a distance of five miles. Its distinguishing mark is the Morse letter U · · — (dot dot dash). The duration of the dot eclipse is half a second, the duration of the dash is three times as long. But I keep in the background the fact that, adhering simply to the letters of the Morse alphabet, we can with the greatest ease give twenty-eight distinctions, each thoroughly unmistakable for any other. This has a tendency to frighten "practical" men. I therefore to some "practical" men scarcely venture to call the distinguishing mark which I would propose for any one light a "letter," and rather say "You will know that is Sanchoty Head, a short and a long," and have it printed in the list of lights; and again "You will know that is Gay Head, a long and a short." Nobody can but answer "Yes" to this question. The moment you see a short and a long you know that it is not Gay Head, but Sanchoty Head, or in the case of two lighthouses not very far from one another it may be judged expedient to have one of them marked by different numbers of eclipses. The Sanchoty Head, for instance, might be the letter E (one short eclipse of half a second occurring every ten seconds, or every five seconds, as may be judged ex pedient). Then the Gay Head might be the letter U (· · —), or the letter D (— · ·), or the letter R (· — ·). (You may tell them that a short and a long is the letter N if you please; but I am told that it would perplex "practical" men to tell them so much: I don't believe it, because I don't find sailors more apt to be confused than landsmen by anything in reason. Still, as long as I speak to Lighthouse Boards and their secretaries and engineers I am quite ready to say nothing about the Morse alphabet, but when I get to sea I do not find that a sailor is at all more apt to mistake the Holywood light for anything else when I tell him "that mark means the letter U "). Is there any hope that your Lighthouse Board would give the eclipsing system a trial? For three years back I have continually pressed it on our Hydrographic Office, but I have had even more cold water thrown on this proposal than on the pianoforte wire sounding. I should not be at all sorry for either them or the Elder Brethren if the United States authorities were to anticipate them in this matter as they have in the sounding by pianoforte wire. I have had two years' struggle with the compass department of our Hydrographic Office to induce them to take up some suggestions I have brought before them for the correction of the compass in iron ships. They are most obliging in giving me information, but are utterly immovable for anything like co-operation for anything new, as they were in the matter of sounding by pianoforte wire. I now see that if anything is to be done in the matter the whole business of it will fall upon myself, and I have therefore resolved to take out a patent for a new form of compensator and appliances which I have now made. I doubt whether with all the obligingness that has been shown to me I should be more successful in getting a trial of it than I have been in getting a trial of the pianoforte wire by our people, until I can offer it to them as a patented invention. I enclose a small paper by which if you glance at the conclusion you will see that my great need is small needles. I have now a compass on my table before me with four needles, of which the longest are each two inches long. In the course of this summer I hope to get a thorough trial of it at sea with the appliances which I have designed for determining the error due to the ship's magnetism. In the course of the last two or three days it has helped me to a very startling discovery regarding the correction of the quadrantal error by soft iron correctors as hitherto practised. The best thing hitherto done in this way undoubtedly is the iron cylinders of the Liverpool Compass Committee applied to our Admiralty standard compass. The results are described in page 174 of the second volume of your reprint of papers on the magnetism of ships and the deviation of the compass. There I find the maximum deviation produced by a pair of the 12-inch cylinders with their ends 7 inches from the centre of the compass card stated to be 12° 50′. Now I find by experiment that considerably more than one-half of this error is due to magnetization induced in the corrector by the needles of the compass! Hence if the 12-inch cylinders were applied at Liverpool to correct a quadrantal deviation of maximum value 12° 50′, the error would be enormously over-corrected in the same ship in the Gulf of St. Lawrence, and very much under-corrected at the equator. An infinitesimal needle placed at the position of the centre of the Admiralty compass card in those trials would have shown about 5° of effect only instead of 12° 50′. I am experimenting just now to find as exactly as need be the amount, but I have already seen that it is certainly less than one-half that found in the reported trials. I intend to send a short communication to the Royal Society on this subject, and hope to have the pleasure of sending you a copy when I get it in print. After further reflection, and careful consideration of circumstances connected with the use of the name 'kelvin', should it be given to the Board of Trade Unit, I see objections which did not occur to me when I wrote to you two days ago, and which render the objection I had pointed out in my previous letter more serious than it first seemed to me. There would be a great difficulty for the public to understand that Lord Kelvin has no part in instruments of inventions such as Aron's, or Teagues, or Schallenberger's, or Ferranti's supply meters, all giving their readings in 'kelvins', and if I succeed in producing a supply meter myself which may come into practical use, people might naturally be led to imagine that it only is genuine, and that the others are infringements of some priority, or right, that I might supposed to have in respect to the measurement of supply. I think you will agree with me that this is a strong objection against the proposed name, and will kindly excuse my having put it before you only after you have already had so much trouble which might have been spared had I pointed it out three days ago. P.S. Instead of the somewhat cumbrous description 'Board of Trade Unit', the simpler expression 'supply unit' may readily come to be used, and will be quite convenient and satisfactory for signifying the particular unit defined by the Board of Trade for electric supply. It will seem quite natural that the readings of 'supply meters' should be given in 'supply units': and the ordinary householder will be quite satisfied with the simple word 'units' in checking and paying his electric lighting accounts. He, and the general public, know nothing of other electric units: and there is at present no other subject of reckoning in ordinary affairs to which the name unit is given'. On Dec. 23. 1907 — six days after Kelvin's death — the Board of Trade again proposed to change the Board of Trade Unit (which could be easily confused with British Thermal Unit) to "kelvin", arguing that Kelvin's original objection (marketplace confusion should he introduce a Kelvin brand "kelvin-meter") no longer held. The idea was never adopted, in part since a kilowatt-hour is not the sort of unit with which one traditionally honors great scientists. Eventually, the name "kelvin" would be given instead to the unit of absolute temperature in honor of his work on thermodynamics.